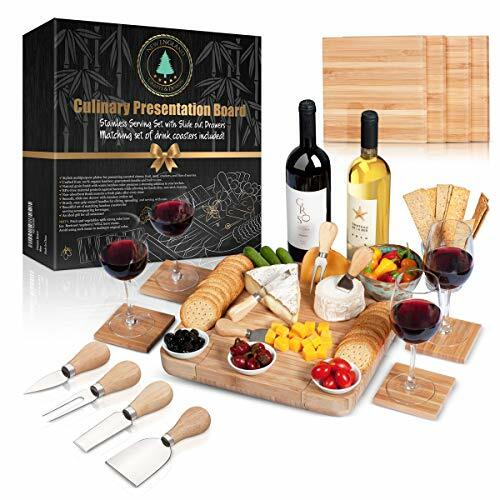 100% Bamboo Cheese Board with Slide-Out Drawer & 4-Piece Stainless Cutlery Set. Includes FREE set of matching coasters. Perfect House Warming Gift & Best Choice For Every Kitchen. Large 13"x13"
Key Features: ★ Stylish multipurpose Serving Tray / Cheese Board for presenting assorted cheese fruit meat crackers and Hors d'oeuvres. ★ Beautiful set of matching bamboo coasters (FREE!) for serving accompanying beverages. ★ An ideal gift for all occasions. Best for house warming gift. ★ Crafted from 100% organic bamboo guaranteed durable and built to last. ★ Natural grain finish with warm bamboo color promises a stunning addition to your kitchen. ★ BPA-Free material protects against bacteria while allowing for hassle-free non-stick cleaning. ★ Non-absorbent finish ensures a fresh plate after every rinse. ★ Smooth slide-out drawer with stainless cutlery set. ★ Sturdy easy-grip utensil handles for slicing spreading and serving with ease. ★ 100% SATISFACTION GUARANTEED! We honor a 30-day no-questions asked return policy. All you need to do is email us directly at: support@necrafts.com ★ Get creative! We've added a guide on the back of the packaging with ideas and suggestions for mixing matching and presenting everything from wine & cheese deli meats to fruits and vegetables and all other Hors d'oeuvres. ENJOY! NOTE: Fruit and vegetables with strong color tone (ex. Beetroot or raspberry) WILL stain. Avoid using these or similar items to maintain original color. GENERAL CARE: Wash your board with warm water and occasional bamboo oil for lasting care. ✔ TOP QUALITY & TOP DEISGN - Made with 100% NATURAL bamboo our cheese board is not only Eco-friendly but also guaranteed durable and built to last. Our unique design includes an internal slide-out drawer complete with a 4-piece stainless cutlery set. Each utensil is equipped with sturdy easy-grip handles for slicing spreading and serving with ease. We've also designed our cheese boards with smooth lowered edges to provide depth in your presentation. BE CREATIVE! GO WILD! ✔ PERFECT GIFT FOR ALL OCCASIONS - Elegant stylish multipurpose serving platter / serving tray. ideal for impressing your guests with creative colorful displays of assorted cheese fruit meat crackers and Hors d'oeuvres. Enjoy your new serving tray year-round for all events-- From hosting dinners to weddings, birthdays, Christmas Thanksgiving, all festive holidays and more! ✔ BEST ADDITION TO EVERY KITCHEN - LARGE (13"x13"x1.5") Cheese Board with natural grain finish with warm bamboo color promises a stunning addition to your home decor. We've also included FREE (4"x4"x0.4") matching set of bamboo drink coasters to complete your serving set! The best gift for yourself and your loved ones. ✔ FIRST CHOICE FOR HYGIENE & SAFETY - BPA-Free antibacterial anti-fungal material ensures unmatched hygiene and hassle-free non-stick cleaning while the non-absorbent odor resistant finish ensures a fresh surface after every rinse. Clean & Safe Cheese Board for every use. If you have any questions about this product by New England Crafts & Design, contact us by completing and submitting the form below. If you are looking for a specif part number, please include it with your message. Bariatric Portion Control Plate 8” for after Weight Loss Surgery - Melamine. Health Eating Educational Visual Tool for Sleeve, Bypass or Band by Dietitian Amanda Clark with Protein, Carbs and Veg.